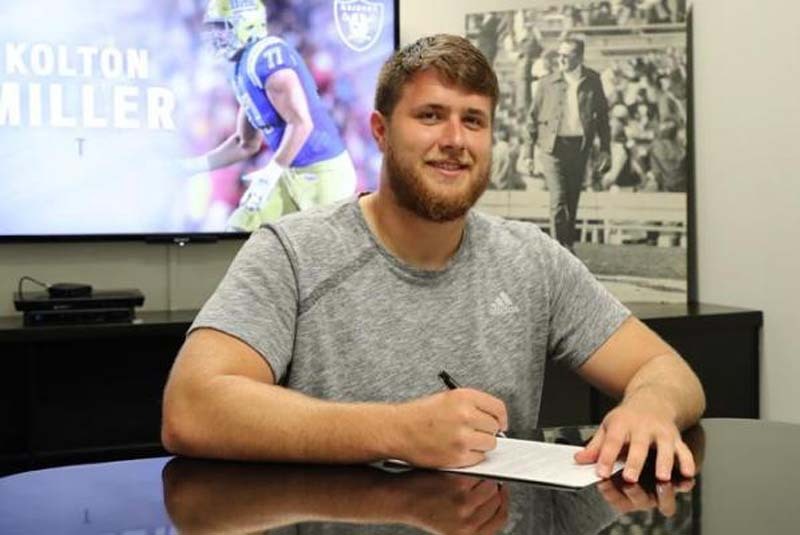 The Oakland Raiders signed first-round draft pick Kolton Miller, the team announced on Friday. Miller, taken with the No. 15 overall pick in the NFL Draft after starring at left tackle during his final season at UCLA, signed a four-year contract that included a team option for a fifth year. The 6-foot-8, 310-pound Miller started 23 of 31 games with the Bruins, playing both tackle spots. He is expected to play right tackle with Oakland. Miller started all 13 games at left tackle as junior in 2017, protecting the blind side of quarterback Josh Rosen, who went to the Arizona Cardinals with the No. 10 overall pick after the Cardinals moved up five spots in a trade with the Raiders.